When designing a mixed member proportional system, two factors are intertwined. 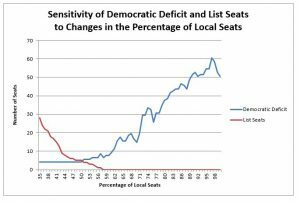 The first factor is the local percentage, which is the proportion of total seats which are local. In MMP systems, the proportionality comes from top-up seats. The lower the local percentage, the larger the ridings and there are more top-up seats, so the proportionality of the system is improved. As the local percentage increases, the ridings are smaller, but there are less top-up seats to compensate for proportionality. The second factor has to do with the source of the top-up seats. Many MMP systems uses party lists to fill all of the top-up requirements of the system (100% list). The problem with this approach is that the voters have not had a say in who goes onto this list. Only the party determines who is on the party list. Local party members might be consulted by their party, but there is no requirement in most systems for this to happen. Simple MMP solves this problem by selecting top-up seats from those candidates who did not place first in the province. By selecting the candidate with the highest percentage of support, the voters have had an important impact on representation. An unpopular candidate is less likely to be selected for a top-up position than one who attracts a large number of votes. This creates a trade-off in Simple MMP. The higher the percentage of local seats, the more likely that all top-up members can be selected from the non-first place candidates. However, when the popular vote for a party is significantly over 50% there will not be enough of these candidates to fill the positions, so we have to turn to a list to fill the required top-up seats. For example, let’s suppose we have a province with 10 seats. There are 5 local seats and 5 top-up, so a party can run at most 5 candidates. If a party were to obtain 80% of the popular vote, then they would be entitled to a total of 8 seats. All 5 candidates would be selected (even if they lost their particular riding), so another 3 people would be needed. The only solution to this problem is to use a party list. When doing the simulation for Simple MMP using the 2015 data, it was found that 5 top-up members would have to come from party lists. These 5 were 1 Liberal in Newfoundland and Labrador, 1 Liberal in Nova Scotia, and 3 Conservatives in Alberta. In each case, this happened because the popular vote was well over 50% for these parties in these provinces. 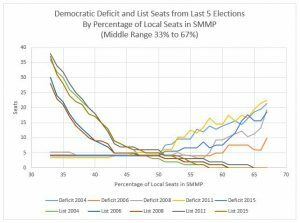 A sensitivity analysis was done with the 2015 simulation to see how the democratic deficit and number of list seats required varied with the percentage of local seats in the MMP. The percentage of local seats was varied (with a minimum of at least local seat per province). The democratic deficit and the number of list top-ups was recorded for each simulation. It should be noted that other simulations will produce slightly different numbers, depending on how the ridings are folded together. However, the patterns are the same, particularly near the centre of the chart, where all the best results come. Simple MMP uses 50% local seats because it appears to be the optimum percentage for minimizing both democratic deficit and number of list seat members selected. This results in a system which uses less than 2% list seats. This simulation was repeated for the last 5 years. The results are shown in the chart below.